Dress standards in Java are more conservative than other areas of Indonesia. It’s a good idea to take a sarong along with you, or to cover knees and shoulders for the temple visits included on this trip. To climb mountains for sunrise, we must start very early! Your sunrise climb of Mt Bromo and Mt Batur start around 3 am. This means you’ll be walking over some gravel and volcanic rock in the dark. Head torches, a rain jacket, some warm clothing and good walking shoes are a must. The view at sunrise is well worth the effort, especially if the weather’s fine! Selamat datang! Welcome to Indonesia. Your adventure begins with a welcome meeting at 6pm today. Please look for a note in the hotel lobby or ask the hotel reception where it will take place. We’ll be collecting your insurance details and next of kin information at this meeting, so please ensure you have all these details to provide to your leader. If you arrive early, check out some of Jakarta’s interesting museums, such as the Wayang (puppetry), Balai Seni Rupa (fine arts) and Maritime museums. The National Museum is great for first-time visitors. For city monuments, don’t miss Si Jagur, an old Portuguese cannon ornately decorated with sexual imagery, or the Monas (National Monument) dedicated to the spirit of the Indonesian people. Familiarise yourself with the city on a morning walking tour with your local guide. Take in Sunda Kelapa port, where the Dutch first landed, temple-filled Chinatown and the old town of Batavia. Visit a Chinese mansion (Chandra Naya) and gain an insight into the beautiful Peranakan architecture. Wander about Fatahillah Square, then explore the religious side of the city at Cathedral Church and Istiqlal Mosque, the largest mosque in South-East Asia. Meander through the antique market at Jalan Surabaya. Today there’s some distance to cover, so you will spend most of the day travelling. Travel by train to Pukuwerto City (approximately 5.5 hours), then take a private minibus to Pangandaran (approximately 3 hours). Pangandaran is a small fishing village popular with visitors looking for a coastal escape. The Penanjung Nature Reserve on the adjoining peninsula boasts some impressive flora and fauna. Head inland by private minibus (approximately 1 hour) before catching a train to Yogyakarta (approximately 4 hours). This town is one of South-East Asia’s real gems. It’s Java’s cultural heart, has a great atmosphere and is an Intrepid favourite. From batik workshops to the nearby Hindu and Buddhist temples, ‘Yogya’ offers a great array of cultural avenues to explore. 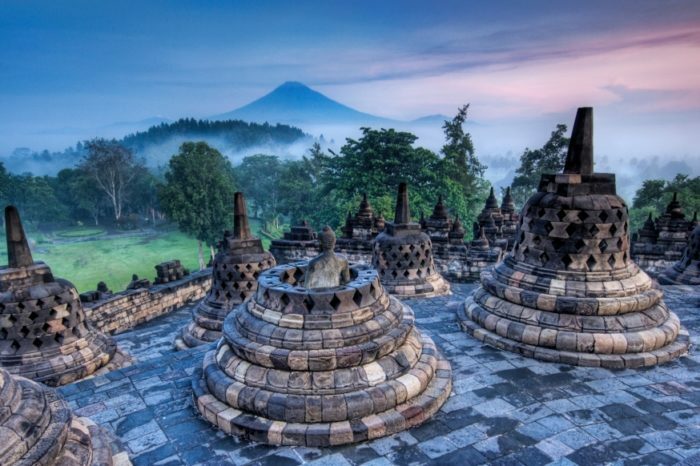 Rise early to catch the morning light and avoid the crowds at Candi Borobudur, the largest Buddhist structure on earth. This magnificent World Heritage site is set in a tranquil park. As you approach, you’ll see the enigmatic temple rise before you, looming above the tropical foliage. With your local guide, follow the route of ancient pilgrims, circling the mandala-shaped structure from the early realms towards Nirvana. It’s truly one of South East Asia’s treasures. Afterwards, enjoy an afternoon of free time. You might like to visit one of Yogya’s other heritage temples – this time perhaps of the Hindu variety. Prambanan Temple is the largest Hindu complex in Java. 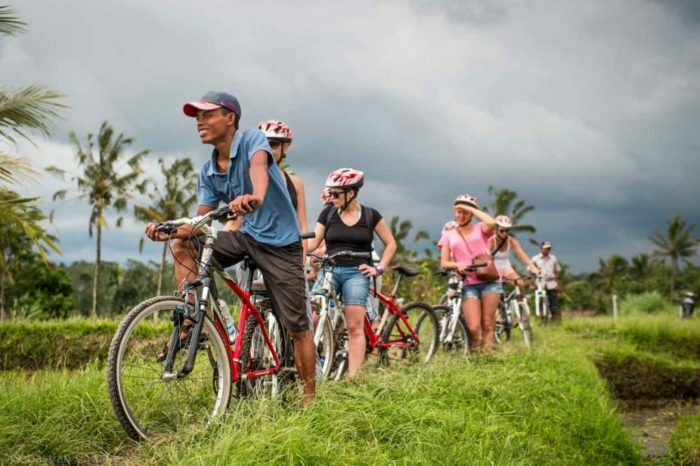 Pedal out of the city on a cycling tour (approximately 6 km) through the rice fields and countryside surrounding Yogyakarta. See the locals in this area making various goods, from bricks to tofu to tempe. As well as palms and lush green grasslands, you will see the odd burst of yellow and pink flowers by the side of the road, which make for great photo opportunities. This cycling tour is on relatively flat ground, so it won’t be too strenuous. There will be ample time to take in all the interesting scenes of slow-paced local life. If you do not wish to cycle you leader can arrange a motorized Becak. Travel by train (approximately 4.5 hours) before transferring on a minivan (approximately 1 hour) to Seloliman Nature Reserve. The peaceful Seloliman Nature Reserve is situated on the slopes of the sacred Penanggungan volcano. Meet some of the volunteers working at the Seloliman Environmental Education Centre and eat delicious, locally grown organic produce cooked by their staff. The centre’s accommodation is atmospheric, with open-air bathrooms built in harmony with the surrounding forest, so take this opportunity to relax. This is a beautiful spot to appreciate nature – be sure to sit under the stars tonight and take in the ambience of the mountainous surrounds. Join reserve staff on a walk around the reserve, learning about the local environment and the Javanese tradition of herbal medicine (approximately 2.5 hours). You’ll gain an insight into local flora and fauna, traditional farming methods, rice production, the mini hydro electricity plant and the local village coffee shop. Finish up with a traditional Jamu demonstration and a tasting of ‘Javanese medicine’. Continue on to Mt Bromo, the timeless homeland of the Tenggerese (approximately 4 hours). The still-active Mount Bromo (2,329 m) is the most well known volcano of the Tengger massif. This region is also the homeland of the Tenggerese and the steep, cultivated hills of the Tengger Valley. Our guesthouse tonight is basic, but we stay here so we have a short drive before starting the hike tomorrow. Retire early tonight, in preparation for tomorrow’s early start. Your early start today (around 3.30am) will be well worth it. You’ll climb to a nearby hill for fantastic views over Mt Bromo. The ascent is not too difficult (approximately 45 minutes), but it can be very cold, so don’t forget to bring extra layers of clothing. It’s also worth bringing a scarf to cover your nose and mouth, as it can get dusty. If the weather is clear, the sunrise over this eerie sea of volcanoes is an unforgettable experience. Afterwards, catch a bus transfer to Probolingo and travel by train to Kalibaru (approximately 4.5 hours). You’ll stop for lunch en route, then arrive in the afternoon, with time to relax by the pool or perhaps indulge in a local massage. Head out early in the morning to tour nearby coffee, cocoa and rubber plantations. You’ll see how rubber is processed, how coffee is dried, and, if there’s time, how cocoa is fermented. Before you set off, enjoy a nice cup of coffee or tea and snack on fried banana. Travel by minibus to the far eastern end of Java, Gilimanuk (approximately 3 hours). There is often a lot of heavy traffic on this stretch of road as it’s the main entry point for Bali, so there may be some delays. Next you’ll board a ferry across the Java Strait (approximately 1 hour), before boarding another minibus for a journey along the west coast of Bali (approximately 1 hour). Travel on to Pemuteran, your destination for the next two nights. Enjoy a relaxing day in this gorgeous beachside spot. Maybe start the day with a relaxing yoga class and then explore the local area at your own pace. Visit the surrounding monkey-filled temples, go swimming, snorkelling, or simply sit back, relax and watch the fishermen go about their work. Make the short journey to Ubud (approximately 5 hours). En route, stop in at Taman Ayun Temple, taking in the impressive Balinese architecture while you stroll around the tranquil gardens. Ubud is Bali’s main arts and cultural centre, recently made famous by the Hollywood movie ‘Eat Pray Love’. 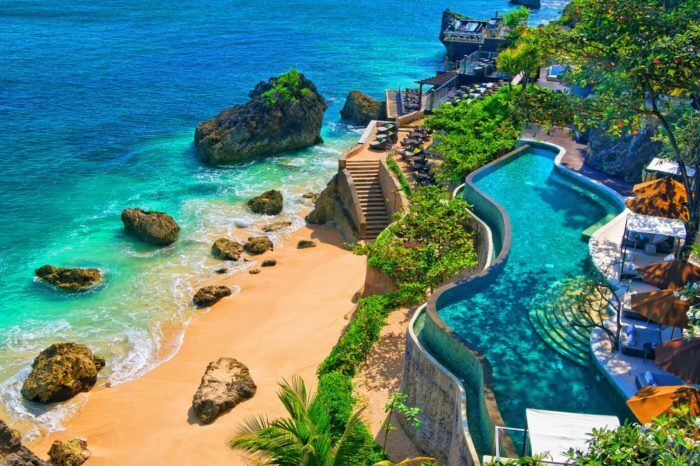 It’s a wonderful place to experience the magic that has made Bali such a popular travel destination. Enjoy a free day to soak up the relaxed atmosphere of Ubud, before your continuing meeting at 6pm. As this is a combination trip, your group leader and the composition of your group may change at this location. There will be a group meeting to discuss the next stage of your itinerary and you’re welcome to attend, as this is a great chance to meet your new fellow travellers. Afterwards, perhaps head out to for a group meal at one of the delicious local restaurants.